Toktok Drift is a total new 3D experience where you get to race, fight, compete, explore and even pimp your own vehicle but this time you will not be the driver of a regular vehicle... TokTok is a small three wheeler known as "Asphalt Devil" that is present in several countries and is also called Tuk Tuk, Tuctuc, or Auto Rickshaw. Think of a toktok as a hybrid between a bike, a motorcycle, a car and a small truck. You can enjoy this game and have your children enjoy it as well. Your boys are just going to love driving their Toktok. Explore new 3D locations that are from all around the world and walk through the game in the open world mode. 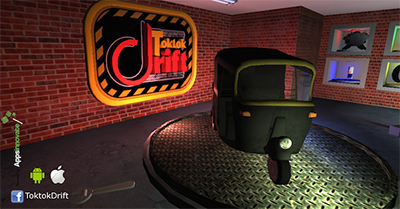 In TokTok Drift we took care of the game ambience starting from the graphics and game design, moving on to the music, sound effects, voice-overs and even the roads and landmarks, all in 3D. Watch out for the obstacles throughout the maps and the weapons your opponents can use against you... Collect weapons yourself to be able to fight back. Don't forget to collect the Red Bull booster cans to boost your speed, and rally through the streets of the city. 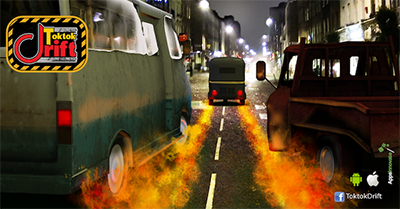 Perform stunts as you race over bridges, jump of ramps and dodge obstacles. The more missions you succeed in winning, the more Tok score you achieve. This will grant you points in the "Pimping Section" where you could upgrade your vehicle and customize it the way you want. 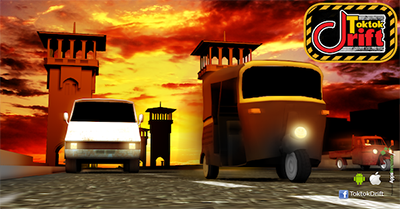 Enjoy wide range of missions ranging from regular one-on-one racing, one-against-many racing, taxi and delivery modes. Enough with the regular racing games and ignite your senses because TokTok Drift is going to take you to a whole new experience that you have never tried before. The great thing about this new trending racing game is that you can enjoy it completely for free. All powerups, additional vehicles, and pimping-up your Toktok upgrades are also for free. Enjoy the 3D gameplay of this action-driving simulator.